QSI has been in business serving The Golden Horseshoe since 1976 and we continually collect helpful information that is relative to our product offering and industry. Give us a call if you have a question. I've never had any condensation on my old windows! 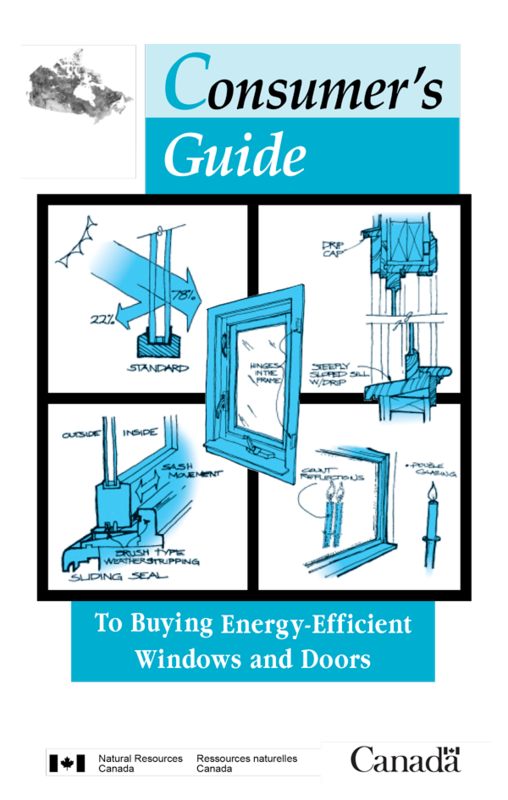 New windows are more energy efficient and a much more air tight, putting a stop to your heating dollars escaping out those loose fitting drafty windows. Along with new energy efficient, tighter fitting doors and adding extra insulation in the attic, our homes are becoming very air tight, not allowing that warm moist air to escape any more. Glass is the coldest surface on the outer walls of your home and as heat goes to escape it will condensate on the coldest surface which is the bottom of any thermo pane of glass. Decorative internal grilles and internal mini-blinds are constructed out of metal which will also conduct the cold, increasing the potential for interior condensation. High performance glass reflects that radiant heat that is trying to escape through the windows, back into the house, warming the glass surface as the heat rises. Now as the room air starts to cool it begins to fall to the floor to find its way back to the furnace by way of the return air vents. As the warm air cools, it falls down across the interior surface of the window. The air contacts the horizontal meeting rail of the DH window, which acts like a dam, slowing the airs rate of fall and creating an opportunity for the trapped water vapour to escape and form on the meeting rails surface. The air then rolls over the meeting rail and gains speed until it encounters the lower sash hand rails or window frame. At this point the water vapour once again makes its exit and condensates on the bottom of the sash. Double pane Low-e and argon gas provides a warmer interior glass surface than a standard air filled thermo- pane. Triple pane, with two Low-e and krypton gas provides the warmest interior glass surface to lower the possibility of condensation. 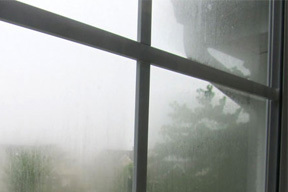 Condensation will still occur on even the highest insulating glass for two reasons. The relative humidity in the home is too high for the outside temperature and/or the interior glass surface is getting colder because curtains or blinds are too tight fitting and not allowing the warm air to circulate around the window to keep it warm. The style of window can also contribute to more or less condensation, such as vertical and horizontal sliding product versus casement, fixed or awning style. Casements, awning and fixed windows do not take on rain water, and also clamp shut when closed and therefore do not require drainage holes to expel the rain water. These windows clamp shut and compress the weather stripping, providing the tightest seal against air infiltration. Vertical and horizontal sliders do take on rain water and require drainage weep holes to expel the water. Sliding sashes have fur weather stripping and interlocks at the meeting rails to reduce air infiltration in colder weather when closed, while being able to slide open in milder weather for ventilation. These drainage systems and weather seals by design, allow some cold outside air to infiltrate back into the home. This air gets trapped when curtains or blinds are too tight not allowing proper air circulation, contributing to a colder glass surface. Now the little amount of warm moist air that sneaks around the tight fitting blinds, hits the colder glass and condensates. Notice when you open the blinds the room air is allowed to circulate and warm up the glass and the extreme condensation starts to evaporate. Yes you can. by addressing the humidity levels in your home. Remember, the condensation will not damage your new windows as there is no wood to be affected. 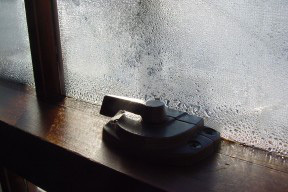 Condensation is unavoidable when the outside temperature drops quickly by 10 to 20 degrees overnight and the indoor relative humidity is now too high. A little condensation is to be expected, a lot is not and will turn to frost or even ice and therefore you may need to reduce the humidity levels in the home. Where does excessive humidity come from? The main source of humidity in a typical home is from regular household activities, which will vary with the living habits of the family. A family of six people will produce much more moisture in the home than a family of two. Typically 7 to 9 litres of moisture per day is introduced into a house with a family of four, under normal conditions, which can rise to 20 or more litres on laundry day. Activities such as showers, laundry, cooking, plants and humidifiers all contribute to adding moisture. Turning the thermostat down a few degrees at certain times during the day, especially in extreme cold weather, greatly contributes to high humidity levels in an active home. You need the heat on to dry the moisture out, otherwise all that moisture you are creating is being absorbed by your carpets, upholstery and walls and you will never dry the moisture out. There are many reasons for high humidity levels in the home and the sources of moisture can be reduced or controlled through continuous air movement, ventilation and keeping the heat at a consistent warm temperature in the very extreme or fluctuating cold weather. Keep the humidity level lower by 10% than the current outside temperature recommends allowing for that 10-20 degree drop over night. The moisture in the house will not dry up fast enough and condensation will occur. Change to a two speed furnace fan or leave your current fan on manual during extreme colder weather. Continually move the air even when the heat turns off. This will eliminate the fluctuation in room temperature, providing more comfort and reducing moisture in the home. Use exhaust fans when showering and cooking, directly venting to the outside of the home. Open the bathroom window when showering to expel the moisture immediately. Turn your thermostat up a degree or two and leave it there. You need heat to dry out the moisture, especially in an active busy household. In newer homes cold air returns are in every room. In older homes the cold air returns are only in the hall ways. If this is the case, make sure the bedroom doors are not touching the carpet and are at least 1 ½” off the floor, or leave the doors open all the time. Hot air rises and cold air falls to the floor, travels along the floor to the return air vents back to the furnace. Curtains and blinds need to be 3″-4″ away from the window, 1″ away from the sides and bottom. They should also be louvered and not solid to allow room air to warm the window glass surface. When the lights go off at night, or any time you can, you should open up the window blinds and curtains to allow the room air to keep the window surface warm, reducing condensation. Open your windows once a day while in the room, for a few minutes to allow the warm moist air to be replaced by the cooler dry air from outside. Warm air takes longer for the furnace to heat than dry air. Be sure that the ventilating louvers in your attic, basement or crawl spaces are open and correctly sized. Update your furnace fan to a two speed fan motor. The fan stays on when the heat burner shuts off, reducing to a lower speed, continually moving the air throughout the house. This keeps the temperature more consistent and reduces humidity. Installing a Heat Recovery System (HRS), air exchanger, to the furnace which not only reduces or eliminates condensation, it removes dust, pollen and mould spores. This system exchanges all the air in your home many times per day. An HRS would be a standard requirement on the most air tight energy efficient homes being built today. Make sure the vents to gas burners, clothes dryers, etc. vent directly to the outdoors. Remove the dryer vent hose once a year and check to see that it is not plugged solid with lint. Reduce the number of indoor plants. When renovating and the walls are torn out, install cold air returns in every room. Other resources for interior window condensation. Exterior condensation occurs during late summer and early fall, when days are warm and humid and nights are cool and clear. Moist air comes into contact with cool surfaces, such as glass. This type of condensation appears when the dew point in the air is higher than the temperature of the outside pane of glass. Windows on elevations blocked from the wind, large bushy flower gardens, holding lots of moisture beneath a window and along with also being protected from the sun for the early morning hours, all contribute to exterior window condensation. This is phenomenon is increasing as windows improve the efficiency of high performance insulating glass. Existing air filled thermo panes would allow the warm inside temperature to transfer through the glass to the cooler outside surface and warm up the glass. No condensation. Your new high performance Low-e and Argon gas glass today, especially with triple glass using two Low-e and Krypton gas, the heat loss or transfer is dramatically reduced. These high insulating glass windows contribute to a cooler outside pane of glass which condensates for a few hours in these atmospheric conditions. Evidence of a well insulated window. Once the outside temperature warms up or a wind picks up the condensation disappears. No harm is done, other than an annoying temporary loss of view. Other resources for exterior window condensation. Low-E glass reflects more radiant heat (temperature) and allows less solar gain from the sun. Low-E glass reflects less radiant heat (temperature) and allows more solar gain from the sun. The heat produced by your furnace in the winter. In the summer when light from the sun hits a solid surface such as the asphalt, concrete or brick it produces heat. The heat that is produced when the light from the sun rays pass through your window, hits the floor or furniture and warms the objects. The measurement of the rate heat is lost through a material or product. The lower the number the slower the rate of heat transferred the better the insulating value. 1 divided by an imperial U-value equals the R-value. Therefore 1 divided by U-value of 0.1 = R-value of 10. Is a measurement of resistance to heat loss through a material or product. The higher the number the slower the rate of heat transferred, the better the insulating value. This is the measurement the amount of heat that is blocked by the sun. The lower the SHGC number, the more the heat from the sun is blocked, better performance to reduce air-conditioning costs. The measurement of visible light transmitted through the glass. The lower the VT number is the less visible light. The measurement of how well a product resists condensation in normal conditions. The higher the CR number is the better the resistance. Window sashes slide open from both the top and bottom. On a windy day you could open the top sash and ventilate the room in comfort. This design provides you the ability to clean both sashes from inside the home. When the top sash is fixed and the bottom sash slides up for ventilation. Both slashes slide open horizontally from each end. Both sashes can be lifted out or can tilt in for cleaning.sun. One sash is fixed and only one sash slides open horizontally for ventilation. Only one sash can tilt in for cleaning. Fixed windows do not open for ventilation and can be combined with multiple fixed or operating windows to create a larger panoramic window. Hinged at the top, the sash opens from the bottom to the outside for ventilation by turning a crank handle. Awning windows work great when reaching over kitchen sinks to open and for privacy in bathrooms. You can leave open for ventilation even when it is raining. Hinged on one side, the sash opens from the left or the right to the outside by turning a crank handle, providing maximum ventilation. Casement and Awning style windows also provide the most efficiency against air and noise infiltration because they clamp tight when closed. The window projects out from the wall with a larger centre panel and angled side panels which can open for ventilation. Factory assembled with new wood head and seat. The window projects out from the wall with four or more equally sized panels curved in the shape of a bow. Operating sections can be incorporated in any panel for ventilation. Factory assembled with new wood head and seat. The window projects straight out from the wall with an angled glass roof that can crank open for ventilation. Mostly for plants and is popular in kitchen and dining room windows. Aluminum extruded frame combined with tempered safety glass and screens for ventilation. Storm doors are installed in front of entry doors to provide added security, ventilation and protection from the elements. Embossed foam insulated smooth metal door panel with the interior and exterior metal skins separated with a wood or composite style to reduce conduction of heat and cold. Pre-painted with optional decorative glass panels, magnetic weather stripping and ball bearing hinges. Embossed foam insulated woodgrain panel. Non conductive material is warmer than steel and will not dent or mark as easily. Factory stained with optional cherry, oak or mahogany grains for that natural wood look. Decorative glass is available. Compression weather stripping, ball bearing hinges and standard multi-point lock sets included. Is a door panel with a frame available in 32″, 34″ and 36′ widths. Two door panels with a main operating door closing into the fixed door with astragal bar. The fixed door can be opened by releasing the top and bottom latches on the astragal bar. This feature is to provide a large opening for moving furniture. A side lite is a narrow framed panel section that is attached to either or both sides of a single or double entry door system. Side-lites are also available with decorative glass to match the entry door. An additional framed section filled with decorative glass that is fastened to the top of an entry door system. Transoms can be rectangular, round or elliptical in shape. Similar looking to a double door system with only one side opening and the other side is fixed in place. The operating door panel can be hinged at the side jamb or hinged to the fixed panel in the centre, allowing the operating panel to swing in against the other panel when space is limited. Also comes with a sliding screen for ventilation. Full tempered glass panels with metal, wood or vinyl reinforced sashes. One panel will slide to open with a sliding screen for ventilation. Used when more glass area is desired or when there is no room to swing in a door panel. Full tempered glass panels with metal, wood or vinyl reinforced sashes. To open, the handle is turned and the one panel will lift and then slide. Also comes with a sliding screen for ventilation. Full tempered glass panels with metal, wood or vinyl reinforced sashes. Designed for very large wall openings where four or more panels are required. One panel will swing open for regular traffic or all the panels will fold and slide open to one side for entertaining. Retractable screens are required for this design. The part attached to the fixed panel of door or window which creates a seal for the operating panel to close and lock into. The exterior part of a window or door frame that overlaps the wall stud. Approximately a 2″ x 2″ material that the brick or siding butts up against, providing a surface to apply caulking to. The device used to lock two sashes together when in the closed position. A soft and flexible lead material used to hold decorative glass pieces together that are offered in entrance doors. A protective material made of metal or vinyl that is applied to the exterior surface of a wood product. A rubber or silicone based product that is applied to exterior joints which prevents air and water from penetrating. Used on entry doors this locking mechanism adds extra security by engaging an extended throw bolt into the door frame. A silica based product in spacer bars used to manufacture insulating glass units. This product absorbs moisture from the air inside the sealed glass unit, preventing condensation from forming inside. The part of a door frame which consists of the sides and head. The door slab is the actual panel which is fastened to the door frame. The door sweep is a weather stripping component that is fastened to the bottom of the door slab, to seal against air and water infiltration. Is a rubberized seal used in place of a butyl or rubber caulk, where extreme heat is a factor. A minimum clear opening size as required by local building codes, to allow occupants to escape through the opening in case of a fire. The result of shaping aluminum or vinyl by forcing the material through a die to produce a length of material formed to a specific shape or profile. The extrusion consists of multiple chambers and internal walls for strength. Flanker The designation given to a unit that is at either end of a centre unit. Is a sheet material that protects the joint between a window/door frame and the adjacent construction by preventing water penetration and draining it to the exterior. Is glass that is formed by a process of floating the material on a bed of molten metal. This produces a high optical quality glass without polishing or grinding. A screen which covers both or all operating sashes of a window. The process of heating the joints of a pvc window to extreme melting temperatures and bringing the heated joints into contact until they fuse together, creating a permanent bond. A closed cell continuous strip of material used to create a watertight seal between joints that may be affected by water or air penetration. Is the process of sealing the glass to the frame or sash. This is a piece of material which holds the glass in place. Decorative vertical and horizontal bars that are installed between the glass panes to create the appearance divided glass panes. This is a screen that covers only the operating sash of a single hung or single sliding window. Is the horizontal top part of the frame of a window or a door. This is the horizontal structural framing member that is at the top of the rough opening which supports the load of the wall that is above the actual window or door. Is the component fastened to a door or window sash that allows it to swing opened and closed with ease. An insulating glass package made up of individual panes of glass joined by a spacer bar and hermetically sealed around the complete edge of the unit. This design feature enables sashes to engage each other when in the closed position. Are the pieces of wood or vinyl which are fastened to the interior window or door jambs to match the depth of the wall providing a surface to fasten the interior wall casing trim to. A handhold integral part of the sash designed for raising, lowering or sliding the window sash. A unit of glass used in a window or door. This is the combination of a head, jambs and sill components of a window or door system. Where the vertical or horizontal sections of a pair of sliding sashes that meet when the sashes are in a closed position. It is the fiberglass material used when making window or door screens. It is the vertical or horizontal connecting unit between multi-lite windows or doors. It is a window or door locking hardware that locks in multiple locations all at once with the operation of only one handle. The term used for a vertical or horizontal bar used to separate glass into multiple lites. An extrusion attached to the window or door frame that is used to secure the unit in place into a rough opening. A glass that is translucent for privacy instead of clear. It is a window that has a sash that opens for ventilation. It is the handle that is used to crank open casement and awning windows. It is the metal pin that is attached to the window sash of sliding windows that will allow you to tilt them in for cleaning. Is the handle or rail that is built into the sash of a sliding window to enable you to open and close the sash. It is poly vinyl chloride which is used in extruded vinyl windows. It is the replacing of product that was not provided at the time of original construction. It is the exposed part of the window or door jamb extension that is not covered by the casing trim. It is a method of fabrication in which light gauge aluminum is run through a machine that bends and forms the metal by using various rollers. Is the framed opening in a wall in which the window or door is to be installed. It is a strengthened or reinforced glass that is less subject to breakage. It is the frame around the glass unit that slides or fits into the window frame. A pull tab is a small nylon grip that you use to remove the window screen. It is when a sealed insulated glass unit begins showing signs of condensation or milky residue in between the panes of glass. Are wood or plastic wedge shaped pieces used to square the window or door in place during the installation process. It is the unit of measure for designating an area of one foot by one foot. When calculating in inches you multiply the width x the height divided by 144 = area in square feet. It is the vertical edge of a door, window or screen. Is the vertical wood framing member that is used to frame a wall. Is the two sided tape used to secure and seal the glass to the sash. Is a heat treated hardened safety glass that is used in all entry doors and storm doors. Should the glass break it will fall into small pebble like pieces without sharp edges. It is the non conductive material that is used to separate two thermally conductive materials, like aluminum. This is a change created in the dimensions of a material as a direct result of a change in temperature. It is a mechanism that releases the sash and allows it to tilt in for cleaning. This is a sash that can be tilted down or swing in to the interior for glass cleaning. A window or door unit the opens or operates. It is the generic term for modified PVC or Poll Vinyl Chloride. It is a non conductive spacer used to make insulated glass units. A material used to form a weather resistant seal around the operating sashes of windows and doors to prevent water and air infiltration. Small holes in window and door sills designed to allow water to escape. A cover over the weep hole designed to allow the water out and close to prevent insects in. Is a silicone based sealant used to secure and seal the glass to the sash. It is the fixed component of a window which holds the sash and operating hardware or the window. The description of the way the window looks and operates.